The countertop for the new peninsula was installed yesterday and templates drawn for the remainder of the kitchen counters so that just about wraps it up. The ECO recycled content countertops are amazing. Made from recycled ceramics, tiles and mirrors, they are very sparkly and I love that. Too bad I couldn't capture any sparkles in my pictures, they are pretty cool. Here is a short slide show of the before, during and after pictures. So fresh and inviting. Lovely! Oh so much work and disruption but the results are SO pretty! I bet you are still just trying to get your eyes filled up with it, I know I would be! Suzy, it is awesome! I love the colors! So retro chic! That’s an amazing transformation. You really gained a lot when you lost that paneled wall section. The colors, the light – love it! You never do anything halfway!! This is just beautiful! 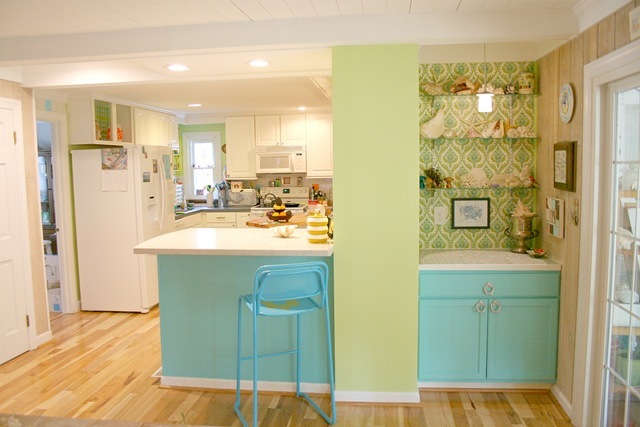 I love the color scheme, the floors, and the counters…the floor plan is much better too.